With our extensive experience and unmatched level of creativity, we became a premium service provider in the wedding decoration industry in Gatineau and Outaouais. We will provide you with customized decorations that suit your requirements and create a unique atmosphere for every wedding, from the simple and traditional to the most sophisticated. Jean and Céline, the founding owners of the company, have worked in the decoration and dj service industry for over twenty years. 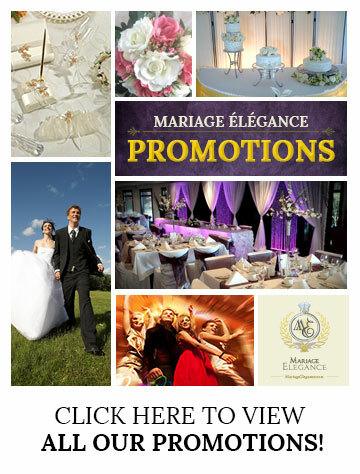 We have gained a reputation in Gatineau and Outaouais for our exemplary client service, high level of integrity, and our dedication to design the most memorable weddings. Our company’s mission is to add a touch of elegance to the weddings of our clients and to ensure that the wedding day remains in their memories forever. It will be a pleasure for us to provide you with services in what we do best. If you would like to have a quote for your ceremony, please do not hesitate to contact us. When you choose us to be a part of your wedding, we take the responsibility very seriously. We consider it an honour to share your special day. We will take time to get to know you and to share your vision and together, we can come up with endless possibilities on what we will be able to create for your special event. "We just wanted to write and say thank you a thousand times for all that you have done and all your help in making this marriage one of the most beautiful day of our lives..."
"Your services were wonderful. Our friends and family still marvel at how well and smoothly the day's events took place. You made our day even more special. What a perfect way to start a life together - a wedding and a reception with your services. Thank you both."